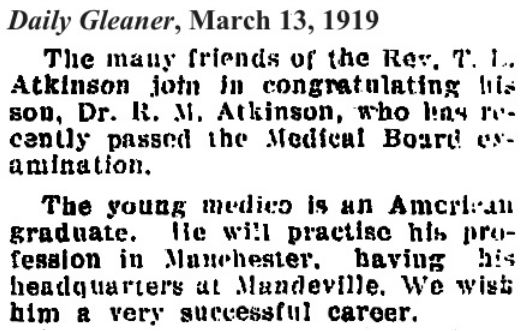 Dr. Atkinson was born on the 18th of August, 1890, at Battersea, a suburb of Mandeville, in the Parish of Manchester. He received his early education under the tuition of his father, the Rev. T. L. Atkinson. Having won a Government elementary scholarship, the doctor was sent to the Manchester School, of which the late Rev. M. F. Johns was headmaster. At this school the deceased made rapid progress and passed his Senior Cambridge Examination, gaining distinction in most of the subjects. On leaving school he studied dispensing under the late Dr. George Cook, the then D.M.O. of Mandeville. He passed the Dispensers' Examination very creditably. He worked for some time at Four Roads in St. Andrew, and then proceeded to the United States of America where he studied medicine at "Tufts College," Boston, Massachusetts, and showed himself a brilliant student. At the close of his college course he gained distinction having passed in honours gaining 85 per cent in all subjects, and 90 per cent, in midwifery. 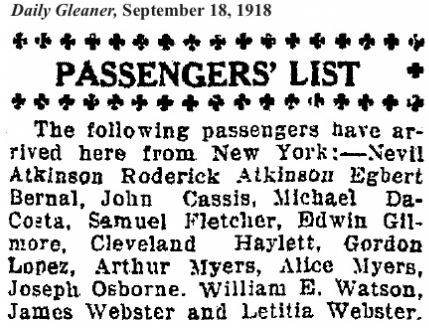 Leaving "Tufts College" he returned to Jamaica during the "Flu" year, and was put Into active service. He afterwards appeared before the Jamaica Medical Board and passed successfully. He was appointed D.M.O. for Ulster Spring in Trelawny, where he established a wide practice and was greatly beloved by all who came in contact with him. On the resignation of Dr. Bond, Dr. Atkinson was appointed to serve on the staff of doctors of the Lunatic Asylum. He was at that institution for some time and then accepted the appointment of D.M.O. at Gordon Town. He laboured in that district for some time, and a few years ago he was appointed D.M.O. at Morant Bay. Owing to ill health he obtained a transfer to the position of D.M.O. for Lower St. Andrew but was unable to carry on. After a prolonged and painful illness which he bore with great fortitude, the end came on Thursday night and he passed away peacefully in the presence of his wife and beloved friends. To the sorrowing wife and other relatives of the deceased the Gleaner tenders its sincere condolence in their bereavement.